Traditional Services. Not So Traditional. Come celebrate, pray & dine with us. You are invited to participate and experience the High Holidays in an inspirational and welcoming atmosphere. The services are enjoyable and meaningful for all, even if you are not familiar with the specific customs and are unable to read Hebrew. The Chabad Center's Junior Congregation is a structured and fun-filled High Holiday program enabling children to attend Synagogue in a meaningful way while allowing their parents to enjoy without worry. 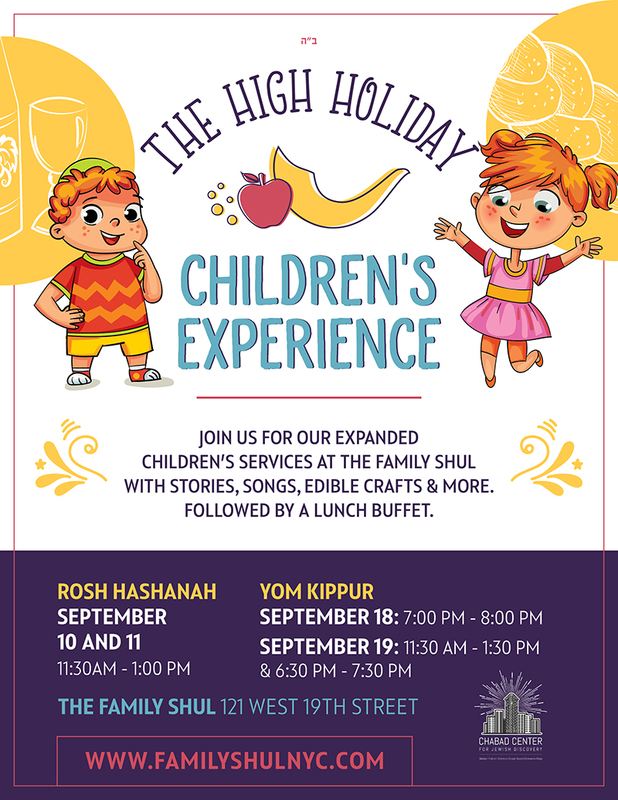 Under the guidance of Morah Gillie and her experienced and dedicated staff, the children are introduced to the wonderful world of the High Holidays and synagogue in a way that makes them want to participate. Each child joins an age appropriate group that is led by warm and enthusiastic youth leaders. The children play games, get fun prizes, sing Holiday songs, hear stories and learn about the High Holidays as they come alive through stories, drama, songs and games.